We in sourcing roles fight this battle with all of the new tools, resources, and technologies that are introduced on a nearly daily basis in our world. Search aggregation tools, semantic technology, auto-monitoring services like the one mentioned in the AdAge article, these tools are all designed to assist us, not to replace us, in monitoring our audiences and what they are talking about. When it comes down to it, we can monitor all we want, but if we never respond, or respond inappropriately, all the monitoring in the world won’t matter. Because we will be out of context and irrelevant. Automation is designed to make certain aspects of life (or business) easier. We have blenders, vacuum cleaners, automatic transmission, copy machines, calculators, and lots of other tools that help us navigate life with a bit more ease. Supposedly, this is to allow us to focus on the more important elements of life. Automating relationship-building just seems counter-intuitive to this concept. I ask this: what in life is more important than relationships? If anyone has seen the movie Up In The Air – well, you get the picture. Granted – some of our messaging systems must be scaled. We need some level of automation to reach large audiences with the same message. We need templates for some emailing activities (not all) or scripts to handle a high volume of identical inquiries. But in my personal opinion, when you’re doing proactive search, that’s not the time to be using full automation. For example: in previous jobs, I’ve worked with vendors that provide a level of automation to social media keyword monitoring. While the capability existed to fully automate responses triggered by specific keywords, we chose not to use this service because when we audited responses that were assigned to certain groupings of keywords, we often got results that were not appropriately matched with the original message. If we were fully automated, we would end up sending an out-of-context response, thus potentially damaging the company brand in the eyes of the recipient. Remember the movie I, Robot? 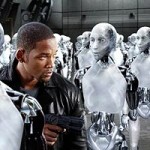 Will Smith’s character is a Luddite cop with a theory that the robots, which have been programmed to assist and live alongside humans, have the capacity to feel emotion and potentially commit crimes. While I certainly don’t think our automated search strings or resume database search engines will suddenly become self-aware and start plotting to kill us, I still believe that certain duties the robots performed, including child care and companionship (i.e. nurturing relationships), cannot provide adequate replacement for human interaction. Communication, in my opinion, remains a human activity – not a robot’s responsibility. The important lesson here is this: automation is great for simplifying certain aspects of life. It’s great when we’re using sourcing technologies to help us reach, monitor, and understand more and more people. But there’s no replacing an element of human touch when it comes to beginning new relationships with potential candidates. There should still always be a real human being in the driver’s seat, quality checking the technology, making sure that messages are relevant, and seeing to it that there remains a human face and human touch to the outreach. What automation tools do you use? How do you maintain personal touch while still taking advantage of automation tools when you are sourcing?